This was not inspired by real life events. I am not a germaphobe. I do not have mysophobia. That large bottle of hand lotion on my desk has nothing to do with the number of times I wash my hands. Completely unrelated to this, I can’t remember the last time I was sick. OH HAY X-MEN WEEK. Or Marvel week, one of the two. What’s the first thing you want to do after cutting up chilies or onions? Been there, done that, nowhere near as painful as the time I snorted wasabi sauce for a dare (and $50!). I think Biff’s mutant power is some sort of flawed immortality, or a twisted variation of heightened intellect. sorry ’bout the double post, but the following have a high likelyhood of being the tiles this week: Xavier, lansherr, grey, munroe, d’ancanto. a suprising number of characters have no last or “non-mutant” name, logan is special though, his memory loss means he has no ability of regaining it. on a side note, he should be able to watch ten minutes of history channel and get a billion flashbacks, so what’s up with that? What about the likelihood of things like Parker, Storm, Stark, Banner, or any of the OTHER Marvel character’s last names, or even comic book characters in general, just cause the first one lands in X-men doesn’t mean they all will. Give Chris some credit, I’ll bet he’s got something original up his sleeve, and I’m not talking about a wrist-mounted hand sanitizer dispenser… That’s been there for months. OH GOD THAT’S GOTTA BURN! @unconscious ink – YES IT DOES… or at least I imagine that it would… I don’t really know. How to develop Super Powers with common products found in your kitchen and bath week…. Yes, I NEED to know more….. Muhahahaha! Oh gawd, I’ve made that mistake before. And I’ve also used hand sanittizer then ate lunch.. Not even tacos tasted good then. @ Michael: Be grateful. Wasabi is stronger, but it doesn’t last as long. Or at least it works like that in the sinoviaculinary way. And I wouldn’t reccomend testing this experience by any other method. I had a similar experience when I got some steak tacos at Milwaukee’s Bradford Beach snack bar. They looked *really* good in the article about great summer eats, but the eye did not reveal from the picture or the item itself what the mouth was in for. I believe there may have been a warning at the counter, but who takes those things seriously? It could also be bad side effects week. Or ignoring warning labels week. Or…something!!! I don’t know! I haven’t been sick lately. Just injured. I don’t keep a bottle of hand sanitizer on hand. Aww crap….I did that last week! Not with sanitizer, but I am fond of slicing cucumbers and soaking them in vinegar (with salt or salt substitute) and I unthinkingly did this after I had finished with the vinegar. OWIE! Thats because its Vancouver, that area of Canada gets less winter then anywhere else in the country because of pacific currents. Even though it is well north of where I live. We get normally over 3 feet of snow. Chris, you just jinxed yourself! Now you’re going to get sick. 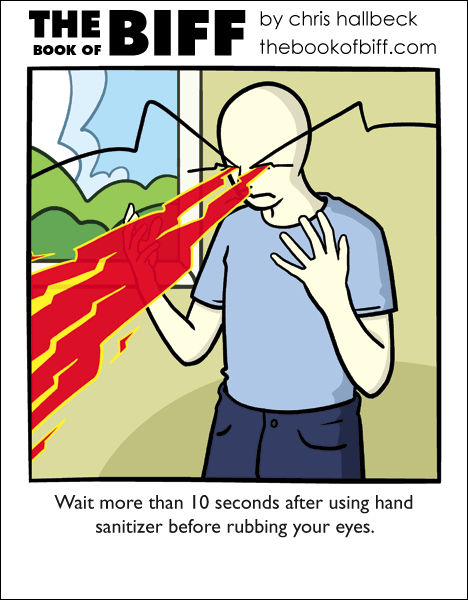 The week before this comic, we set off bug bombs in our house and I didn’t cover my contact lens case. The next morning, I was wondering why my eyes were burning so much. I considered calling in blind. Still, at least Biff doesn’t have to keep his eyes closed unless he has special glasses. In bootcamp, we used hand sanitizer to get rid of pink eye. The crazy thing is is that it worked. …It has to do with other things, the lotion. And it does–but when I get pink eye, I’ll remember that.